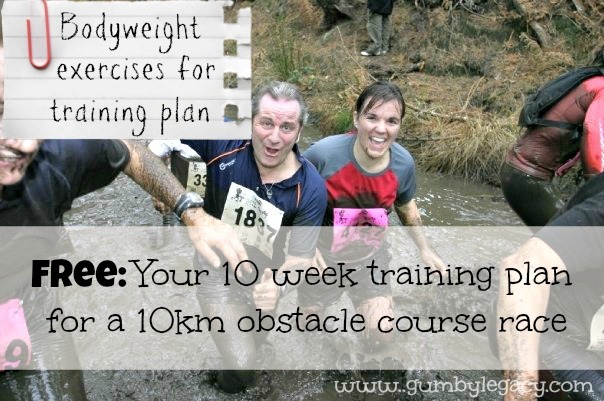 Here is some information to go with the 10 week training plan for a 10km obstacle course race. This has been for a fundraising event a group of us have crazily signed up to do in just under 10 weeks time! Each exercise links to a video which I have checked out and think they all explain really well how to do each exercise correctly as well as how to adapt it if needed to make it easier or harder. Most of them also explain why the exercise is good and what muscles it targets which you may find interesting to know. Here is a detailed description of Tabata training too. As it says, this type of training is short but intense when done correctly. If you are a totally new starter with regards to your fitness levels (as I am! ), just do what you can. Try to complete the whole cycle at a slow, steady pace which you are able to maintain. I hope this is helpful. Please let me know if you have any questions or suggestions for other exercises which you have found beneficial.